To Trim Down, Spelman Trades Sports For Fitness Officials at Spelman College, a historically black women's college in Atlanta, have decided to scrap the school's NCAA program. With few students participating in organized sports, the college has decided to devote those funds to a fitness program designed to reach the entire student body. Spelman College has dropped NCAA athletics in favor of a comprehensive fitness program. The school now offers classes like Zumba to help encourage all students to exercise more. So the school decided to drop its NCAA athletics program, which will save about $1 million a year, school officials say. Tatum says about 80 students play sports — just 4 percent of the student body. She'd rather spend the funds previously spent on NCAA athletics on a program that reaches the entire student body. And addressing health problems of African-American women, she notes, is part of the institution's social responsibility. "We know that 4 out of 5 women of African descent [are] overweight or obese," Tatum says. "We know that black women are twice as likely to develop Type 2 diabetes. We know that black women over the age of 20 — something like 40 percent or higher — already have hypertension, high blood pressure." 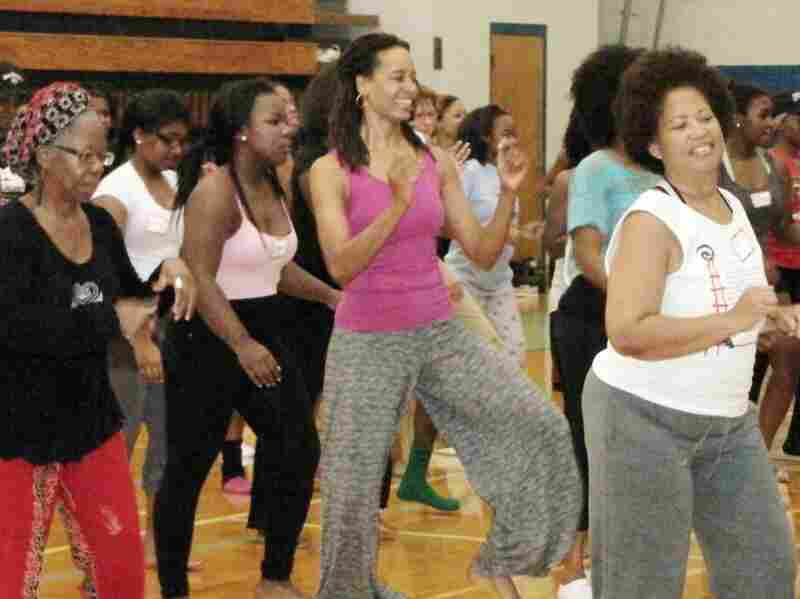 So Spelman has announced the decision to move to a campus-wide health and fitness program. Officials plan to renovate Read Hall, the building that now houses its gymnasium and current wellness program. The school already requires all students to take two physical education classes, and will now add staff to work directly with students on long-term health goals. On a recent afternoon, Spelman's wellness coordinator, Chavonne Shorter, is working with student Danielle Winfrey. She asks Winfrey, a senior who's trying to lose 100 pounds, to step on the scale. "Good number," Shorter tells Winfrey, looking at the scale. "It is. Not bad for the holiday. No weight gain. ... Great job." Shorter assesses students' overall health, designs an exercise program for them, and outlines goals. The school is also trying to find ways to attract students who might not want to come to a regular exercise class. "So we look at maybe offering a dance class. Like right now, we have a Zumba class that's going on," Shorter says. "So a person may not look at it as fitness, but as more dance activity. But in actuality, in a Zumba class, you can burn anywhere between 500 and 700 calories." Shorter says some 300 students participate in activities here every day. Winfrey, for example, is running stairs as part of her workout. She's lost about 50 pounds here, and says she sees the need to expand the health initiative. "Everybody loves the athletics program here, but I think there's more students here that have their own fitness goals than we have actual athletes," Winfrey says. "So I think this [new wellness] program is more inclusive for the entire Spelman community." But there are some who don't like the idea of dropping sports. Basketball coach Terlynn Olds watches closely as her players practice layups in the small gym that is their home — for now. "We shot 42.2 percent from the field last night. Got to keep it up," she calls out to the players. "Athletics is more than just putting a ball in a hoop, or hitting the ball the hardest or running the fastest," says Olds, who moved from Florida about a year ago to coach basketball at Spelman. Athletics teaches teamwork, leadership and life skills, Olds says. She won't have a basketball team to coach next spring, so she's already looking for another job. She says she doesn't understand why sports and the wellness program can't coexist. "It teaches you a level of sacrifice that is so hard to explain," Olds says. "Unless you are an athlete or a former athlete, you don't understand what tools and gifts and things that you learn that carry you throughout your entire life." Olds says her players are upset but didn't want to be interviewed. They love basketball, and some wonder if they'll be able to transfer to another school. But Spelman President Beverly Tatum says the school's plan is the best decision for everyone. "You know, anytime you make a change, something's lost," Tatum says. "But I think more will be gained. We all have to think about how we are better addressing the health needs of this generation." Spelman is the first college in years to announce it will drop NCAA sports. Tatum says she doesn't think big schools will follow suit — but she predicts many smaller schools will consider the option.